Gregory Moore is a classically influenced popular singer with a voice rich and expressive who has been singing and entertaining since he made his debut at ‘carols by candlelight’ aged just 5 years old. He grew up surrounded by music in a family with a passion for singing and performing and graduated from the Queensland Conservatorium of Music in his home city Brisbane, Australia in 1998. Since then his career has blossomed with impressive live shows appealing to a wide audience who respond to his warmth and diversity. 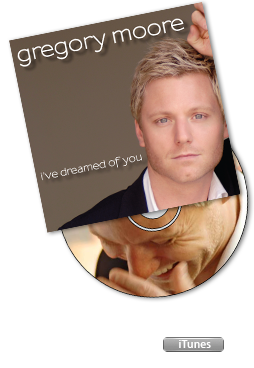 On stage Gregory has performed as a concert soloist with The Queensland Pops Orchestra, Australia’s leading Symphony Orchestras, The Wellington Sinfonia, The Perth Pops Orchestra, The State Orchestra of Victoria, and The Australian Army Band, Brisbane. He was the voice and face for World Water Day 2006 in Brisbane and has twice performed the National Anthem at the Official Australia Day Flag Raising Ceremony. Due to Gregory’s contribution to the arts, he was invited to be an Australia Day Ambassador for the Queensland Government (2009 - 2011). Commencing in 2001, Gregory spent 18 months touring Australia as understudy to Simon Gallaher in the ESGEE production of The Pirates of Penzance playing the lead role of Frederic on a number of occasions and was an original member of the popular male ensemble The Ten Tenors. Gregory has toured extensively throughout Australia, New Zealand and Canada as the Tenor Soloist in the acclaimed production of Scotland the Brave the international smash hit celebration of the best of Scottish music, song and dance. In April 2009, he made his American debut performing in Scotland the Brave at the prestigious Avery Fisher Hall, Lincoln Centre in New York City. His television appearances include Good Morning Australia, the Denise Drysdale show, Brisbane Lord Mayor’s Carols, Brisbane Festival 2000 International Tattoo, and Scotland the Brave live from the Sydney Opera House on ABC Television, which was also released on CD & DVD with ABC Music selling some 100,000 copies. The 2010 production of Scotland the Brave has been released on DVD/CD through ABC Music and has achieved Gold Status!. Gregory has performed the National Anthem for the Official Liberal Campaign Launch and at the Four Nations Rugby Grand Final between Australia & New Zealand at Suncorp Stadium in Brisbane. This was televised to a World Wide audience through FOX Sports and SKY Sports. Gregory was also invited to sing 'The Prayer' with Delta Goodrem at the official opening of the Hyatt Surfers Paradise. Gregory is a regular freelance producer for Brisbane City Councils Creative Communities & Events department and in 2011 was the Music Director for the Myer Christmas Parade & Pantomime held in the Queen Street Mall, Brisbane. His album of contemporary and traditional Celtic songs was recorded with the QLD Pops Orchestra and released Nationally in 2010 and made Album of the Week on Radio 2GB Sydney with Alan Jones OA. Christmas 2010 saw the release of his Christmas album - The Christmas Gift- sold exclusively through David Jones Nationwide with retail profits being donated to the Children’s Cancer Institute Australia. He also performed a special one night only concert – “An Intimate Evening with Gregory Moore & Friends" at the Brisbane Powerhouse which was filmed for the Ovation & Studio Chanel on FOXTEL. A live DVD/CD of this concert is NOW AVAILABLE.